Burnishing a floor involves polishing it to a high shine. While this is a simple process on some surfaces, concrete requires special techniques and tools to impart a glossy finish. Correct preparation helps provide the best results, while proper cleaning and care help ensure optimal longevity of the smooth surface. Initial burnishing requires grinding the surface of the concrete to a satiny finish. Regular burnishing can keep a smooth concrete floor polished to a high sheen. Clean the area you plan to burnish. Use a large push broom to remove obvious particles of dirt and debris. Work the broom around the corners of your garage, basement or other interior rooms to remove any visible soil from the concrete surface. Use a damp mop to scrub up stains and dirt. Rinse the surface with fresh water to remove all traces of grit and debris. Check for remaining soil by wiping several sections of the floor with a clean, white rag. If you notice any soil on the rag, repeat the mopping and rinsing process. Leaving particles of soil on the surface can cause scratching and marring. Let the floor dry completely before burnishing. Read the operating instructions for your floor-polishing machine. These machines come in a range of sizes, including small sizes that you can push by hand and large pieces of equipment that you ride on. Some require water to polish the floors, while others use dry sanding pads or waxed buffer pads. Attach the roughest sanding disk to the machine first. Following the manufacturer’s instructions, run the polishing machine over the surface of the cleaned floor to begin the shining process. Repeat the procedure with smaller-grit sanding disks, finishing with the smoothest buffer pad. 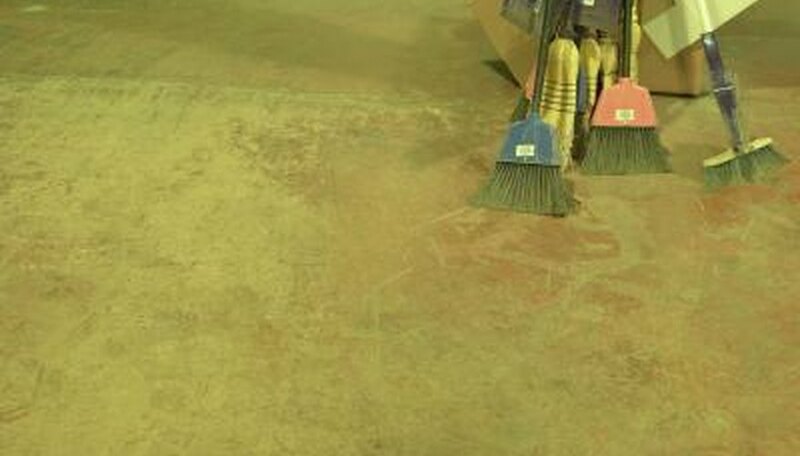 Mop the fine particles of dust off the concrete floor and allow the floor to dry. Apply a resin concrete sealer over the satiny surface, following the manufacturer’s recommendation. Buff the dried coat of the resin with the buffer pad on the floor polisher. The heat and friction created during buffing will help burnish the surface of the floor, leaving it shiny and glossy. Repeated buffing will create a higher sheen and increase the level of light reflection. Prolong the sheen of your burnished floor by sweeping it regularly to remove sharp particles that can scratch the surface. Wear clean shoes when walking over the concrete floor during the cleaning or polishing process.